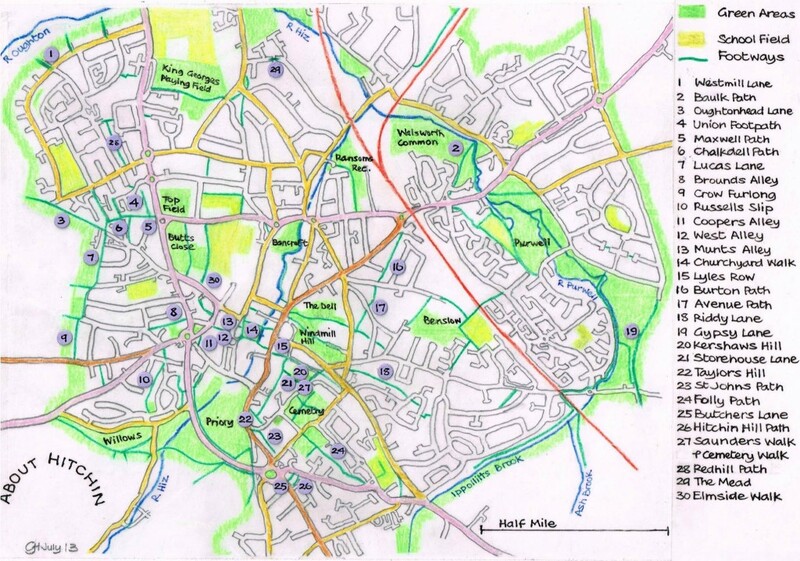 This is a local map to help explore and enjoy Hitchin. We hope that it is fairly accurate, but OS maps will give definitive rights of way. The paths are, we believe, all public rights of way or permissive paths, but please let us know if this is not the case. If the path is marked in brown its status is uncertain. Click on spaces, paths or markers for more information and weblinks. which go along town streets shown in purple. along with other paths, in red. For the HICCA leaflet – click here and here. additional paths, or more information, or even mistakes. All comments welcome. combination of impermeable clay over chalk.